416 / 417 style diopter sight set for Picatinny. Will fit all Weaver or Picatinny rails. This diopter is German HK production that was made for the HK G3 and HK33/53 series of weapons. This is a multiple weapon rear drum sight which is combat effective to 400 yards with NATO 5.56 or 7.62mm. 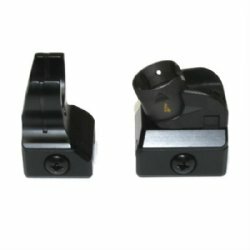 These are not MMR223 sights for barrel specific rifles, rather a sight that works on all 5.56-7.62 weapons. Though the diopter sight and mounting hardware are German HK production, the Picatinny sight bases are not German. They are a high quality military grade reproduction made from aircraft grade aluminum with steel hardware. We also offer just the bases so you can add a more specific HK drum sight of your choosing: MP5, 33/93, G3, HK21/MSG90 1200M, etc; SKU HKK-1010. Condition of the parts: Front sight and rear sight base are brand new. HK Diopter sight is surplus VG-EX condition. They are as close to new as you can get from German army surplus. Might have a mark or two from demill but otherwise look fantastic. Product Review: Sights were as advertised, shipping was quick. Great value. Highly recommend. 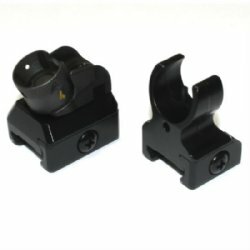 Product Review: Installed on my personal AR rifle, they fit great and are very solid, a must have for those of us who love the G3 sights. "Best Sight and Best price"
Product Review: First set on 10mm AR pistol. 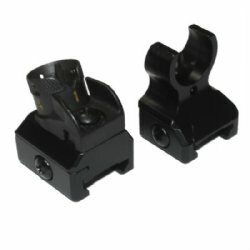 Buying a second set now for AR 308 rifle. No comparison to anything else on the market that attempts to be like this sight. Product Review: Excellent Value!....Solid Sights!........Lower 1/3 Co-witness with a Red Dot sight!......and they look AWESOME on a 15 AR rail!